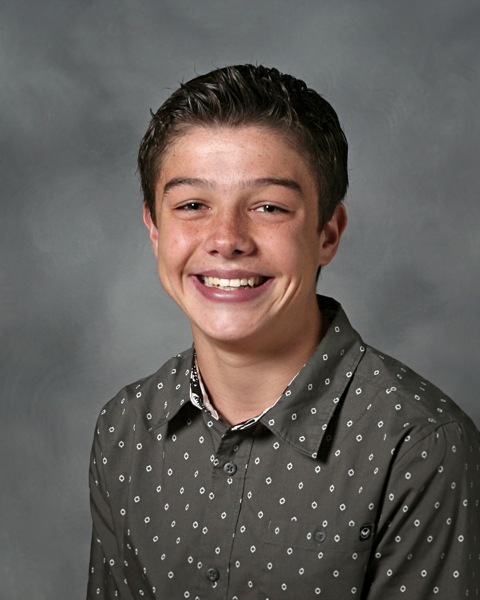 Riggs Bryan Gibbons, 16, passed away on February 9, 2015 in Phoenix, Arizona. He was born to Bryan and Auburn (Sherwood) Gibbons in Phoenix, Arizona on January 14, 1999. Riggs was a loving older brother to siblings Jaxen and Roxy. Riggs is survived by grandparents Sam and Vicki Sherwood, Duane and Janette Gibbons, and Valorie and David Haussman. Having been born with a congenital heart defect, Riggs spent 16 years defying medical odds, building faith, and bringing hope to his family and doctors. Riggs contracted an infection in his blood and because he was born without a spleen, he was unable to fight it. He will always be remembered as a young man with a contagious smile who loved life. Riggs was a member of The Church of Jesus Christ of Latter-day Saints, and he had a burning testimony of the gospel and his Savior. He wasn’t afraid to share his testimony and touched many lives by doing so. We are confident that Riggs was called home to his Heavenly Father to serve the mission he had spent his earthly life preparing for. Our beloved son, brother, grandson, nephew, cousin, and friend will be dearly missed. A visitation will be held from 6:00 – 8:00 pm, Friday, February 13th with Funeral Services held at 10: 00 am, with a visitation 1 hour prior, Saturday, February 14, 2015 at the Church of Jesus Christ of Latter-day Saints, 1865 S. Higley Rd. in Gilbert, Arizona. So very sorry for your loss. He was a very handsome young man. Prayers for all. He is your angel now God. Our prayers go out to all of you!! My daughters were friends with Riggs. He will be missed! We love you Bishop, Vicki Sherwood and family!! Love, Cassie, Cami and the Selvidge Family. Dear Vicki and family, my prayers go out to you at this time of sadness. I want you to know that I think about you often and I know Heavenly Father will comfort you at this time and in the future. Love you guys. My heart goes out to the Gibbons family. I cannot even imagine the range of emotions you are all going through. My kids and I will keep you in our hearts, thoughts and prayers. This sweet young man will be waiting for you. I loved everything I knew about Riggs. I will never forget the first time I saw him, he was leading the youth at the combined activity, as the deacon quorum president (I think it was) I was new in the ward and was so impressed I asked my fellow youth leader, who he was. The answer I got was, “That’s Riggs. He’s like Joseph Smith.” As I got to know him over the next few years, I learned there was something special about him…just like Joseph Smith. I’m glad I got to see him play church ball a couple weeks ago with my boys. He always put his whole heart into everything he did. God bless the Gibbons family. I am so sorry, and I love you guys. I will always remember Riggs and that great smile and his heart of gold. I loved Gibby and his love for life. I feel blessed that I knew him and got to know his spirit. My God be with you in this time and know that he will always be with you. amber, I am so shocked and sorry for your loss. My father passed away last Sunday – he had lung cancer and I took off work for a few weeks to care for him. Our memorial is this am-tough days ahead, but use the Lordbto be your rock! Please let me know if here is anything I can do for you. Auburn, your sweet family has been on my mind all week. I don’t know if you remember us, we were in your ward in Gilbert when Riggs was born. Such a fighter, and such an adorable baby. Our thoughts and prayers are with you and your family, I’m so sorry for the pain you all are going through right now. ~Much love, the Varney family. Riggs has this smile larger than life! As his 3rd grade teacher, I have always felt this connection through his siblings Jaxen and Roxy. He always tried his best, loved his friends, and had a huge heart for others. Photos I have of him shares an extraordinary memory of the reflection of this current photo. As others have shared I can hear his infectious laugh. The goodness of his inner self and how he shared that with his peers. Riggs has always been one of those students who made a difference in my own life as his teacher. May the Lord Jesus Christ heal your heart my brother. I send my love, 4 ever PALS! we are the parents of Jennifer Griebeler your next door neighbor. We just want to let you know how very sorry we are for your loss. I’m so sorry to hear about Riggs. I teach first grade at Chaparral and although I was never his teacher, my son Parker Palmieri, had classes with Riggs during their time at Chaparral. Parker always spoke very fondly about your son and was quite saddened to hear about his passing. I know that this is true of more students than you may realize. Riggs touched many lives. You must be so very proud of him! I pray that you feel God’s peace and comfort as you adjust to your life without him. We are so sorry for your loss. Please know that we are praying for you at this time. Our thoughts and prayers go out to the Gibbons family. Riggs smile will definitely be missed at church but I know his spirit will still be there. We really wish we had got to know Riggs better but when I heard the terrible news of his passing it felt like he was my brother. Thank you Gibbons family for raising such an awesome boy. Riggs set an example we can all learn from. How exciting it is that we can have eternal families and that he’ll be waiting in Heaven. we are very sorry for your loss. Sending you prayers, hugs and strength. To The Gibbons Family, we met you all when Riggs & our son Brandon were on the same baseball team at 5 or 6. They played for a few seasons. Riggs was our daughters first crush at 5. They becam good friends later. Riggs always brought a smile to our faces. Our deepest condolences to you all. God has a handsome Angel with a perfect heart now. No one can prepare you for a loss, it comes like a swift wind. But take comfort in knowing that Riggs is now resting in the arms of our Lord. Our deepest condolences to you and your family. We were so saddened to hear of the loss of your sweet Riggs. Bryan and Auburn, we remember being in the hospital with you at the same time when our daughter Kendall and Riggs had surgeries and were in the ICU together. He would have been about 1 1/2 years old. We remember the little spunky fighter he was and Bryan telling us that he was giving the nurses “a run for their money” . We understand that he was a shining light to many and will be remembered for his amazing spirit. Please know you have been in our thoughts and prayers, and will continue to be in the weeks ahead.